In this blog post, I point out that there is growing evidence that there some so-called “active learning” teaching strategies (on average) improve learning outcomes for all students while also (on average) improving learning outcomes disproportionately more for women, students of color, and/or first-generation students. …women in non-IBL courses reported statistically much lower gains than their male classmates in several important domains: understanding concepts, thinking and problem-solving, confidence, and positive attitude toward mathematics. In fact, both men and women reported higher learning gains from IBL courses than from non-IBL courses, but traditional teaching approaches did substantial disservice to women in particular, inhibiting their learning and reducing their confidence… Overall it appeared that non-IBL courses tended to reinforce prior achievement patterns, helping the “rich” to get “richer.” In contrast, IBL courses seemed to offer an extra boost to lower-achieving students, especially among pre-service teachers. Yet there was no evidence of harm done to the strongest students. Now contrast that paper with this recent paper: Johnson, E., Andrews-Larson, C., Keene, K., Keller, R., Fortune, N., & Melhuish, K. (2018). Inquiry and inequity in the undergraduate mathematics classroom. Proceedings of the 40th Annual Conference of the North American Chapter of the International Group for the Psychology of Mathematics Education, pages 966-969. These researchers looked at student learning in an Inquiry-Oriented Abstract Algebra (IOAA) course taught by 12 different instructors. They compared the performance of these students with those in more traditional Algebra courses at other institutions using the same content assessment instrument. They found that men and women performed similarly on the instrument in traditional courses but that men outperformed women slightly in their sample of IOAA courses. And, this performance gap was bigger for some of the 12 instructors than others. How do we square the research of Laursen et al with that of Johnson et al? 1. First, the student sample size in the Laursen et al paper (over 3000) was much bigger than that for the Johnson et al paper (513). And, when the latter authors analyze student performance in specific instructors’ courses, those numbers are even smaller. It’s natural to have larger sampling variation with smaller samples. And we’re talking about something much more complicated than taking samples from the same normal distribution. Two students might sit in the same course, listen to the same instructor, and do the same assignments, but might still have very different experiences in that class based on their life experiences, identities, interests, etc. Corresponding, their learning outcomes might be different too. I see the Johnson et al paper as a warning to us all that it’s not enough just to employ some of these active learning instructional practices. We need to also be more intentionally inclusive as we teach in more active ways by paying attention to the experiences that students have in our courses. This reminder is also echoed by Elham Kazemi and Corey Drake in their plenary paper at the same PME-NA 40 conference (where Johnson and her colleagues presented their work). 2. We should remember that these empirical papers measure student learning and/or attitudes under different conditions for learning but they don’t explain the mechanism behind why some students might benefit or be harmed by those conditions. In other words, it is still not clear why IBL courses seems to have a disproportionately positive effect on women in the paper by Laursen et al. 3. And, keep in mind that Laursen et al measured student self-reported gains while Johnson et al directly measured student learning on a content area assessment. We would expect self-reported learning gains to be strongly correlated with performance on a content assessment, but they aren’t the same thing. Finally, how do we think about this work by Johnson et al in relation to this CBMS statement promoting active learning? How do we adopt a critical stance when studying these instructional practices without jeopardizing the movement toward broader adoption of active learning in our field? 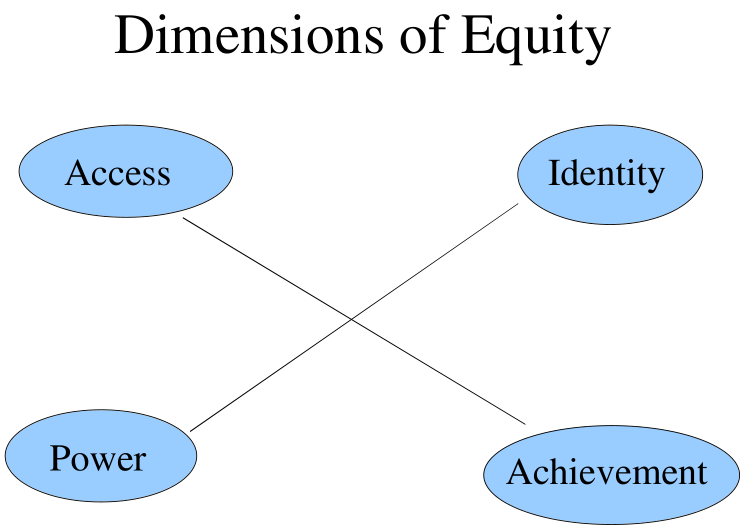 Rochelle Gutiérrez’s dimensions of equity comes to mind (even though she is no longer using the term “equity”). When we tout active learning via studies that show that it can produce disproportionately positive effects for women, students of color, and other marginalized groups of students (and I have done this! ), that primarily emphasizes the dominant axis of access/achievement, since those studies generally quantify equity via summative measures of learning. What is missing is a focus on the critical axis of identity and power, which can greatly affect how students actually experience the learning in our classes.